The leader has been accused of ’emptying out’ the bill by LGBT rights groups in the country. 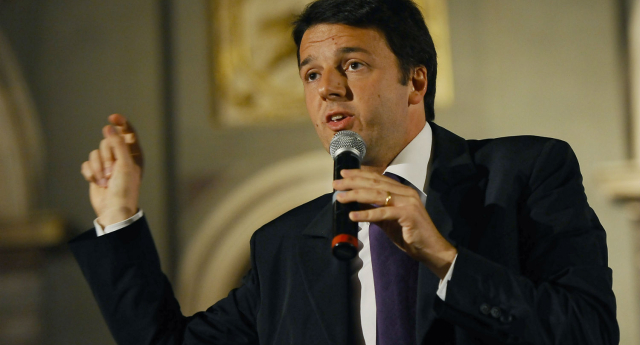 Italian Prime Minister Matteo Renzi will drop adoption rights from a civil unions bill in order to push the controversial legislation through parliament. Senators from his Democratic Party backed the proposal at a meeting on Tuesday (February 23). Their decision comes after pro-Vatican senators in the party stalled a vote on the bill over a provision that gave limited adoption rights over the gay partner’s biological child. “Between ‘everything never’ and ‘nothing today,’ it’s better to do a little piece now,” Renzi explained in a radio interview ahead of the discussion. He went on to say that he hoped the Senate would approve the amended bill later this week before sending it immediately to the lower Chamber of Deputies. LGBT group Rainbow Families said the decision to remove the adoption rights amounted to the “emptying out” of a bill that was already a “modest compromise”. The bill has stirred up resentment between the LGBT community and the country’s powerful anti-gay Catholic lobbying groups – with large rallies and political manoeuvring against the measure. Vile signs at one rally linked to Catholic groups compared gay people to Nazis – while Prime Minister Renzi told the Church to keep out of the debate, given the legislation does not actually impact religious marriage. Amid a debate around the bill, a group a senators also proposed prison sentences for gay couples who use overseas surrogates.